Hemingford Home, Nebraska, 1922. Wilfred James (Jane), a farmer, owns eighty acres of land. His wife, Arlette (Parker), owns an adjoining one hundred acres of land, an inheritance from her late father. They have a teenage son, Henry (Schmid). Arlette is frustrated by having to live outside of town and wants the three of them to sell their combined land and move to Omaha. Wilfred is against the idea, but Arlette is insistent, telling him that if he won’t agree to her wish then she’ll sell her hundred acres and move to Omaha anyway; and she’ll take Henry with her. Wilfred is against this idea even more, and decides that he needs to do something to stop his wife from going through with her plan. 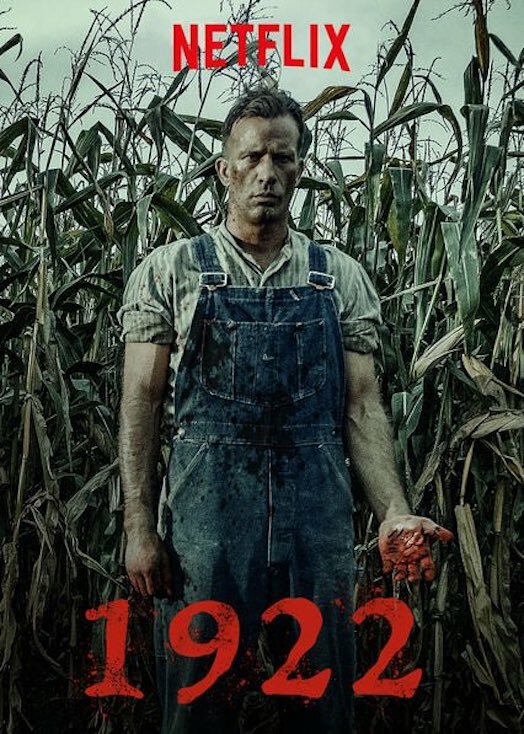 Secrets, and the dead, rarely remain quiet, and this is very true in 1922, the latest feature from Australian movie maker Zak Hilditch, and the latest in what seems to be a neverending conveyor belt of Stephen King adaptations that have been released this year. Once Arlette has been killed, things go quickly from bad to worse to simply terrible for Wilfred, as his relationship with Henry disintegrates, and Arlette’s ghost – aided by the presence of rats that seem to be in league with her – begins to appear with increasing malevolence. Wilfred has no one to turn to, no one he can ask for help, and as he sinks into a morass of terror and despair, he finds that his one fear, that Arlette’s leaving would be the ruin of the farm, is going to happen anyway (though just how he and Henry by themselves were going to manage one hundred and eighty acres remains a mystery). Taunted by Arlette’s ghost, menaced by rats, and abandoned by Henry who runs off with Shannon, Wilfred’s fate is sealed. Despite its obvious thriller and horror trappings, 1922 is a movie that’s more concerned with its traditional theme of pride going before a fall. Many of the characters exhibit this trait in one form or another, and while it does provide the backbone of the narrative, writer/director Hilditch is clever enough not to overdo it. He adopts a matter of fact approach to the material that serves it well, and especially when pride turns to guilt and then to unavoidable resignation. There’s grief here too, painful, overwhelming grief, and again, Hilditch makes it an organic part of the narrative, and not something to be trotted out to make one or two scenes work independently of all the rest. These emotions are pervasive and tied to the fates of all concerned. When Wilfred comes up with his plan, it’s not just Arlette that is doomed, it’s Henry, and Shannon (they become Bonnie and Clyde-style robbers nicknamed The Sweetheart Bandits), and Harlan too. These emotions also help anchor the movie when it moves into the realm of the supernatural, and they help to make Wilfred’s situation all the more credible in the face of Arlette’s ghostly return. The supernatural elements do feel a little forced however, with Arlette appearing randomly at first, but always at moments when you’d expected her to. 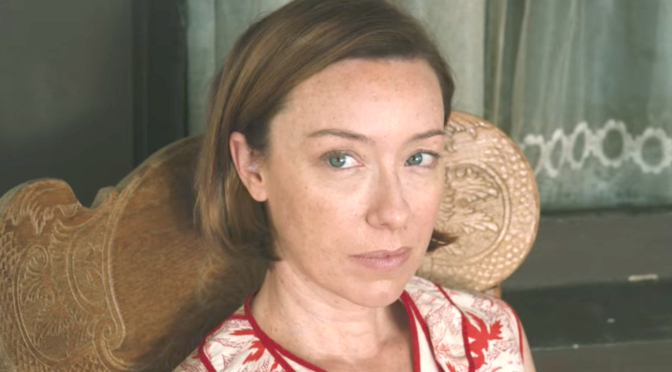 And despite Hilditch’s best efforts, she’s not really that frightening or scary, her presence more of an obligation to the story than something to really be afraid of. Of course, she appears in a post mortem state, with blood and all, but it’s only in the movie’s best sequence, where she relates Henry and Shannon’s fate to a cowering Wilfred, her lips in kissing distance to his face, and shot in close up, that Hilditch makes the most of Arlette’s oppressive presence. As Arlette, Parker has little to do except be a self-regarding shrew for around twenty minutes before being killed off, and quite explicitly at that. 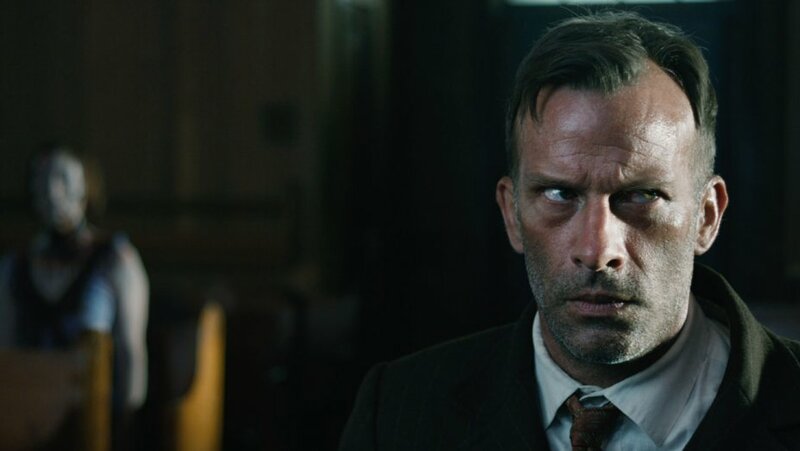 Schmid is good as the conflicted yet defiant Henry, rushing off into the world without a clue as to how to tackle it and paying the price for his feelings of guilt and anguish. The other secondary and minor performances range from adequate to perfunctory, but all in all this is Jane’s movie from start to finish. Jane’s now rugged features are a perfect match for Wilfred, and helped by a severe haircut he paints a terrific portrait of a man defined by his pride and his actions, and who does what he does out of loyalty to the land and to his son. That both are taken away from him when he would sacrifice his own life for both of them – something that Jane incorporates into his portrayal with ease – adds to the tragedy of it all. This is by far and away Jane’s best performance in quite some time, and one that maintains a subdued energy throughout. The era is replicated quite nicely, though the movie does suffer from a surfeit of patently false looking backdrops and CGI surroundings, no doubt a budgetary constraint rather than an artistic decision, but these are noticeable, and they do hamper the sense of time and place that the movie is looking to represent. The movie also moves at a slow, deliberate pace that suits the material in the early stages, but which does it no favours when applied to events in the last forty minutes. The story itself is told in wraparound fashion by Wilfred as he writes everything down in an attempt at a confessional while in a hotel room (not 1408). Here, Hilditch eschews the ambiguity of King’s original ending in favour of one last fright, and while this does provide a frisson to see out the movie, its literal nature isn’t quite as effective in terms of the story as it could have been. But these are caveats in a movie that gets far more right than it does wrong, and which can be added to the list of better than average Stephen King adaptations. Rating: 7/10 – Hilditch has adapted King’s novella with a great deal of care, and 1922 is one adaptation where the characters and their motivations and emotions are more important than providing just a succession of frights and jump scares; a slow burn build up helps also, as well as Jane’s compelling performance, making this a movie that, while it may not be to all tastes, is still worth seeking out on its own terms.